This section will contain any small news items not worth a post in itself. If this new information contradicts older posts, I will endeavour to update them. 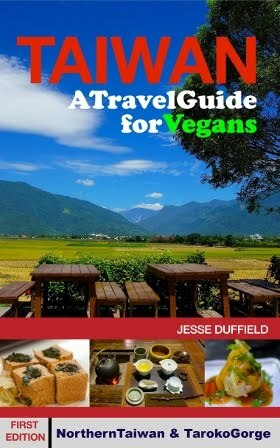 However, if you are vegan in or coming to Taiwan please read this section to ensure that everything else is up to date. Also, if you find a new vegan product somewhere, or notice that one is missing, or not vegan (anymore), please email me. Though not really news anymore, I have updated my 7-11 post to include their updated vegan range, see my post here. To the philosophers following this blog, please do not post philosophy in Chinese any more in the comments section! 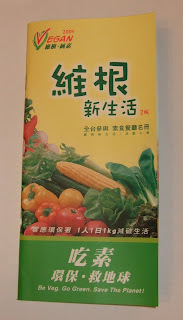 I haven't deleted any of it because it is on a good philosophical note and not spam (in case any one wondered), but this blog is specifically about veganism in Taiwan. Comments about veganism are getting lost in the philosophical titbits, so please stop - thank you. I recently noted that Mos Burger - hardly a chain to get excited about - sold a vegan burger, and that it was an option for a quick eat if one was at the high speed train station in Hsinchu. This has been DISCONTINUED, making the only vegan options a salad (a few leaves) and a coffee. When I asked for vegetarian, the staff pointed to another burger that could be made without whatever flesh was in it, but when I asked if it was vegan, they said no. It also doesn't have the vegetarian logo that the salad and previous vegan burger had, so we should assume that no burgers at Mos Burger can be made vegan. The only option at the hsinchu high speed train station now is the 7-11 meal. A recent festival ("The First Environmentally Friendly Conference for the Disabled") in Taipei included at least a dozen stalls by "Supreme Master" Ching Hai selling vegan food, products, and Ching Hai clothing and other items, and of course many giving out free information about the merits of a vegan diet. There I found the following very handy list of most (or perhaps even all) vegetarian restaurants in Taiwan, organised by city. It is all in Chinese, so is perhaps of limited value to the traveller or newbie to Taiwan, however since most street names use two of only a small number of characters, it is possible with little effort to be able to recognise street names soon after arriving in Taiwan. The other downside is that since it lists all places in a city, chances are that most will be either a typical small noodle house (which all serve very similar food) or a typical buffet. I am slowly working my way through the Hsinchu ones. So again, it's more a useful resource for someone living in Taiwan than for the traveler. Hundreds of people attend the "Environmentally Friendly Conference for the Disabled". Most stalls were selling vegan food or promoting vegan items. The familiar "Go Vegan" banner can be seen above some stalls. In the background is the title "Liberty Square" which replaced "Chiang Kai Shek Memorial Hall" on the entrance to this somewhat controversial public square in downtown Taipei. Thanks for the all the information. I have been living in the states for the past 7 years and will return to Taiwan (and Hsinchu) for the first time this winter. The wide selections of vegetarian option has always been part of Taiwan that I missed the most even though I am not a vegetarian or vegan.